This page will serve to document anomalies or odd behavior observed on WFC3. A brief description and links to relevant documents will be provided for each behavior. CTE data taken in TV2 on the backup UVIS detector indicate a current charge transfer efficiency of >99.9999%. For a full description, see the ISR below. A standalone IDL procedure is available for correcting UVIS data for crosstalk, effectively restoring pixels to a mean which is well within 1 sigma of the mean of surrounding pixels. The code as well as a description of its use is available as part of ISR 2012-02. Ghosts due to scattering from the window and filters of the UVIS channel have been observed in WFC3 ground testing. In all filters except for two (FQ232N and FQ243N), these ghosts contain less than 0.6% of the source flux. Typical ghosts are in the 0.3 - 0.4% range. For the two filters mentioned above, the ghosts can contain up to 7% and 5% of the incident source flux, respectively. Images of stars on the WFC3 CCD can form ‘ghost’ images, as shown in the two images below. In those images, the bright star in the lower right quadrant, the Amplifier D quadrant, forms the “figure eight” ghost images near the center of these full frame exposures. Note that the major axis of the pupil image points at the bright source. right-hand image contains two additional, larger ghosts of the same star in the upper left quadrant (Amp A). One of these two ghosts is cut off by the upper edge of the CCD, but the other is fully visible. A filter ghost can be seen at the 4 o’clock position of the star’s image. The ghost images are caused by reflection off the CCD and return reflections from the CCD housing entrance window. Ghost images of this kind are formed only by stars imaged in the Amp D quadrant. Further information may be found in several WFC3 Instrument Science Reports. ISR 2007-21, Figure 4 illustrates the area of the CCD that can form optical ghosts and Figure 11 contains an image of similar ghosts taking during ground test. 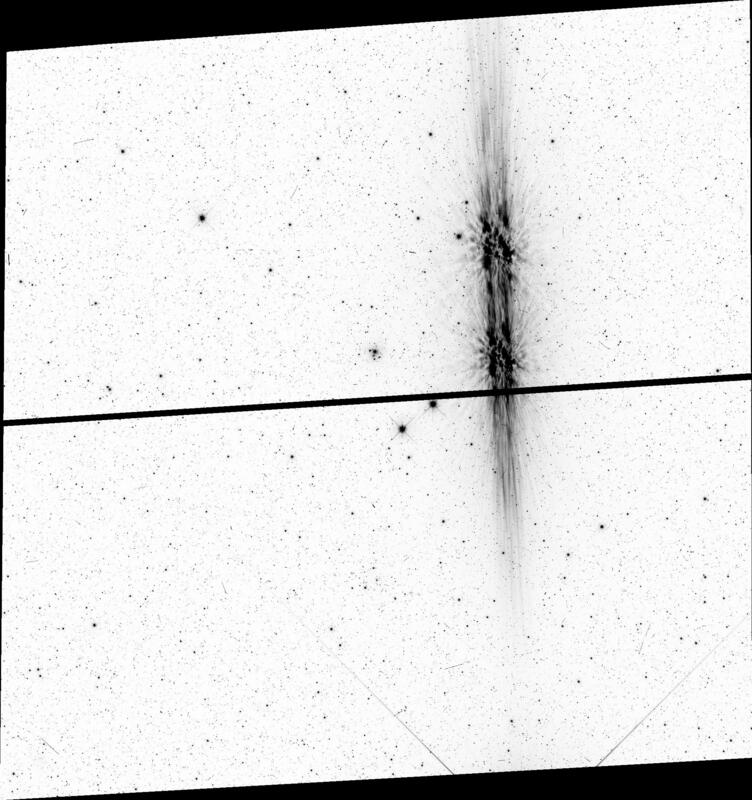 ISR 2004-04 characterizes the optical ghost images, finding that each image contains approximately 1% of the stellar signal. ISR 2001-17 presents an optical model. 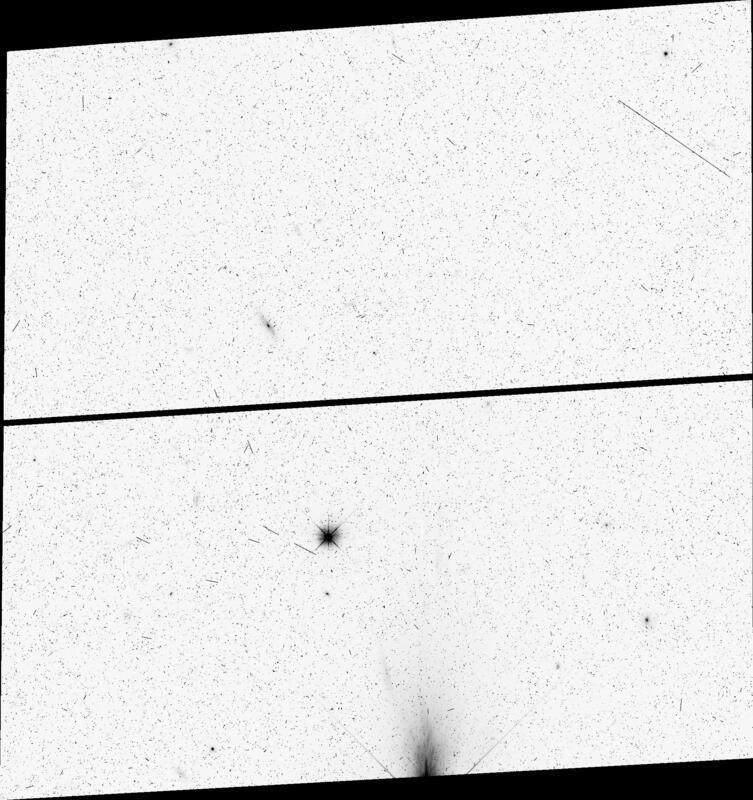 WFC3/UVIS, Proposal 11452, F814W, and 350-sec exposure time, exposure root name `iaby01lcq' (top) & `iaby01leq' (bottom). Many stars lie immediately outside the image captured by the WFC3/UVIS detector. These stars can create a notable pattern of artificial light on the detector that is called ‘Dragon’s Breath’ when it originates from the edge of the detector, and ‘Scattered Light’ when it’s disconnected from the detector edge. To plan around the more severe examples of these effects, see the two user tools below. Click here to view an interactive dragon's breath plot. Click here to view and search a table of visits with dragon's breath. The dark current behavior of the pixels in the IR detector cannot be completely described by a single number. The distribution of dark current values across the detector is a skewed Gaussian, with a tail of high dark current pixels. The dark current distribution of the IR flight detector will be characterized in the upcoming TV3 testing. The IR channel is affected by inter-pixel capacitance (IPC), in which the signal measured by one pixel is felt by its neighbors, resulting in an over-production of electrons. This can be thought of as an artificial increase in QE of the detector. From ground testing, we have determined that the effects of IPC can be removed by scaling the measured signal downward by a factor of 0.88. This correction will be implemented in CALWF3. Crosstalk effects have been observed in the IR channel. Positioned symmetrically opposite the source about the dividing line between each of the coupled readout amplifier quadrants, IR crosstalk appears at a lower level than the surrounding background, about ~1e -06 that of the source signal. The level is low enough that it should not be an issue for most programs; dithering can help mitigate the effect. More details of the ISR crosstalk are available in ISR 2010-02. Unlike the UVIS channel, no significant ghosts were observed in the IR channel during TV testing. See the report below for details. Image persistence in the IR array occurs whenever a pixel is exposed to light that exceeds more than about half of the full well of a pixel in the array. Persistence can occur within a single visit, as the different exposures in a visit are dithered. Persistence also occurs from observations in a previous visit of completely different fields. Further details can be found on the WFC3 persistence page.